I lost count of how many times I sat down to post this so it's going to be super short and sweet. Garden and baby duties are coming first this week. 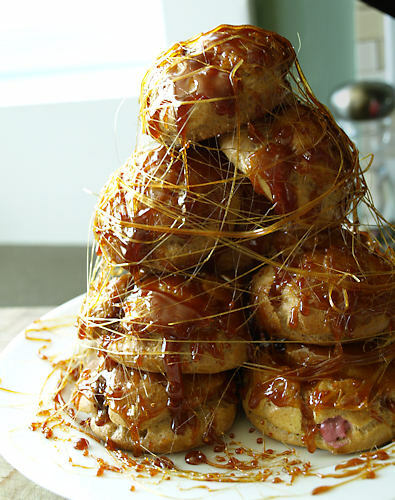 But I did find time earlier in the month to make a "crack in the mouth" tower, in French croquembouche. For my modifications, I used half whole wheat flour because I think choux pastry tastes a thousand times better that way and I used extra virgin coconut oil in place of the butter. My son Alex demanded raspberry filling and so I made the vanilla pastry cream with So Delicious Coconut Milk Creamer French Vanilla and added raspberry puree and a touch more sugar. I also filled some with homemade lemon curd. Neither Alex nor I liked the coconut creamer pastry cream. It wasn't bad but the plastic/artificial flavor of the creamer disappointed me. Back to the drawing board to find a better dairy-free pastry cream, I just can't seem to make rich dairy-free puddings that I'm truly happy with. Making the tower, I burned several fingers and got the caramel a tad too dark but it was fun to stack them and cover it with spun sugar. Nice challenge! -View the full recipes at Little Miss Cupcake. -I highly recommend the choux pastry formula in this Heavenly Baked Crullers with Cherry Glaze recipe. I've used it a ton of times. I halve the recipe, use it make puffs instead of crullers and make my own glazes and fillings. I think the whole wheat flour makes puffs so nutty and tasty. 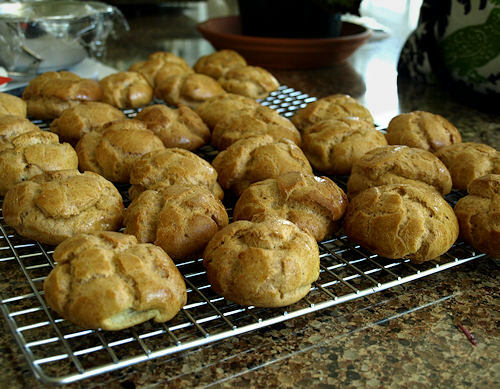 Though I've tried several other choux recipes, I haven't found one I like better. -Sorry to say I can't recommend So Delicious Coconut Milk Creamer. As much as I'd love to have a dairy and soy free heavy cream replacement without a coconut flavor it tastes just as awful as any other coffee creamer. And seriously, why is the stuff made fat free?! -Visit the Daring Kitchen and see all the other towers of wonder made this month by browsing the Daring Baker Blogroll.